Called in his day the “patriot-artist,” John Trumbull served in the Continental Army from 1775 to 1777 and became known for his images of the Revolutionary War—a prime source of material for contemporary history paintings. After resigning his commission, he went to London to study with Benjamin West, returning to the United States with the plan to immortalize the country’s struggle for independence in a series of paintings based on the critical events of the conflict and thus create to a new iconography for the new nation. He ultimately completed eight compositions, and in 1817 Congress awarded him a commission for four large canvases to decorate the United States Capitol. 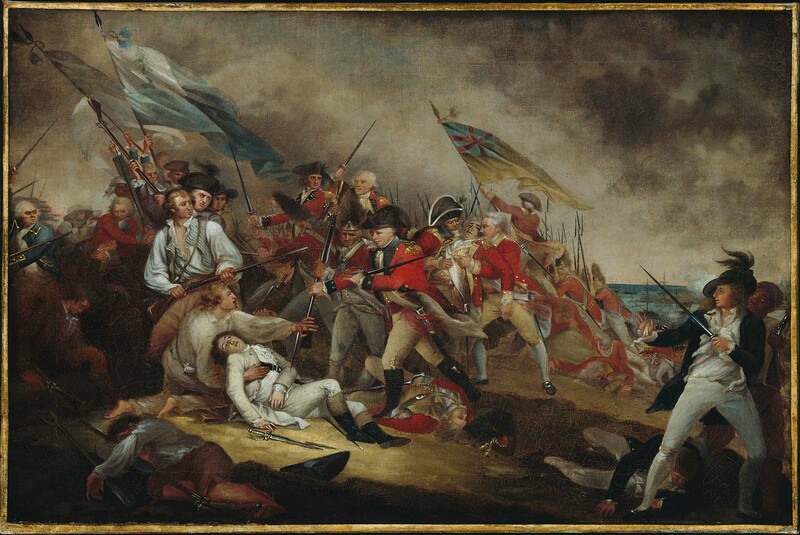 The Death of General Warren at the Battle of Bunker’s Hill, 17 June 1775 was the first Revolutionary War subject that Trumbull completed. (The scene was not chosen for the Capitol, however.) Joseph Warren [95.1366], perhaps today less well known than Paul Revere [30.781], John Hancock [L-R 30.76d], or Samuel Adams [L-R 30.76c], was one of the key players in the events leading up to the outbreak of war. A popular and innovative physician—among other things, he advocated inoculation and cleanliness in the treatment of his patients—Warren plunged into politics in the late 1760s as an author of persuasive anti-Crown literature, an orator of eloquent speeches, and an underground leader of the growing revolutionary movement. He accepted a commission as a major general on June 14, 1775, but it was as a volunteer that he was killed three days later at the Battle of Bunker Hill. Warren’s heroism immediately captured the imagination of the American public. He was so idolized that in the decade following his death there were more towns and streets named after him than after George Washington. John Trumbull, who himself was at Bunker Hill, immortalized the tragedy in dramatic fashion in a composition that, like Benjamin West’s iconic Death of General Wolfe (1770, National Gallery of Canada, Ottawa), refers to old master images of the Lamentation of Christ. In the thick of the turbulent battle, Warren collapses in the arms of a comrade who holds off a further bayonet thrust. Actual participants, both American and British, in the surrounding fray are recognizable, including William Howe, Henry Clinton, and William Prescott (who allegedly gave the order to his American soldiers not to fire until “you see the whites of their eyes”). Trumbull also included two African American enlisted men, representing the significant participation of black soldiers in the event. When Abigail Adams viewed the original sketch for this composition she claimed her “blood shivered” at the sight, so vivid was Trumbull’s depiction of the tragedy. He painted several versions of the subject; the Museum’s descended in the Warren family. 1. Abigail Adams to Mrs. John Shaw, March 4, 1786, in Letters of Mrs. Adams, the Wife of John Adams, ed. Charles Francis Adams (Boston, 1840), 324.